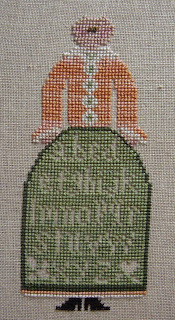 Last month I started a project for Sampler Guild that was one of the yearlong project challenges obtained last September. The challenge was to finish it by the September 2011 meeting. There were three challenge projects and I chose Little House Needleworks “The Sampler Lady” (Little House Chart No. Thirty-Nine). It was suggested we could change it a bit to make it look like ourselves. So I made the blouse peach because that is my favorite color. I also changed the skirt color since I thought the peach and the tannish color of the original was not a good combination and would wash out. I also used a strand of brown and a strand of green for the eyes to try and simulate hazel eyes. Next I need to decide on a hair color and if (and how) to make it curly – current thoughts are French knots and/or bullions. I had also considered adding glasses, but not sure I will. I want to finish it (in time) and so I can get back to my Seminar class piece. She's lovely. I think french knots and bullions would look quite curly. How about twisting a tiny pair of glasses from fine wire and stitching them on? @Sally - They are stitched I just had not gotten to them yet! I used a color similar to the blouse, bugt not sure it was a great idea. Kind of blended in, so once I get the rest done, I will see if I want to play with the letters. I have been very busy, but hope to post and update soon!